There are two different interfaces defined in the .NET base class Library. There is a non-generic IEnumerable interface and there is a generic type-safe IEnumerable<T> interface. The GetEnumerator method must return an instance of an object of a class which implements the IEnumerator interface. In C# language foreach keyword works with all types that implement the IEnumerable interface. Only in C# it also works with things that don’t explicitly implement IEnumerable or IEnumerable<T>. IEnumerable<T> interface inherits from the IEnumerable interface. Therefore a type which implements IEnumerable<T> has also to implement the members of IEnumerable. The out makes the type parameter covariant. That is, you can use either the type or any derived types. Note that out only works this way with generics, it has a different meaning when used in method signatures. // the ICovariant interface is covariant. The out in the interface signature allows you to assign an ICovariant<String> to an ICovariant<Object> variable, as String derives from Object. Without the out keyword, you would be unable to do this, as the types would be different. There are also two versions of ICollection which are System.Collections.ICollection and the generic version System.Collections.Generic.ICollection<T>. ICollection inherits from IEnumerable. There for all members from the IEnumerable interface implemented in all classes that implement the ICollection interface. Generic version of this interface was introduced with .NET 2.0 whereas the non-generic version was already introduced in .NET 1.1. The IList interface a non-generic and a generic version. The following table gives an overview of what interface can be used in different Scenarios. This binding is provided by the BasicHttpBinding class. 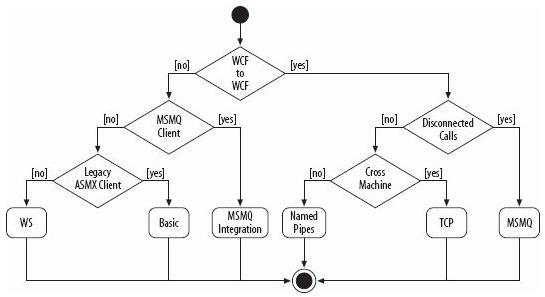 It is designed to expose a WCF service as an ASMX web service, so that old clients (which are still using ASMX web service) can consume new service. By default, it uses Http protocol for transport and encodes the message in UTF – 8 text for-mat. You can also use Https with this binding. This binding is provided by the WebHttpBinding class. It is designed to expose WCF services as Http requests by using HTTP-GET, HTTP-POST. It is used with REST based services which may give output as an XML or JSON format. This is very much used with social networks for implementing a syndication feed. This binding is provided by the WSHttpBinding class. It is like as Basic binding and uses Http or Https protocols for transport. But this is designed to offer various WS – * specifications such as WS – Reliable Messaging, WS – Transactions, WS – Security and so on which are not supported by Basic binding. This binding is provided by the NetTcpBinding class. It uses TCP protocol for communication be-tween two machines with in intranet (means same network). It encodes the message in binary format. This is faster and more reliable binding as compared to the Http protocol bindings. 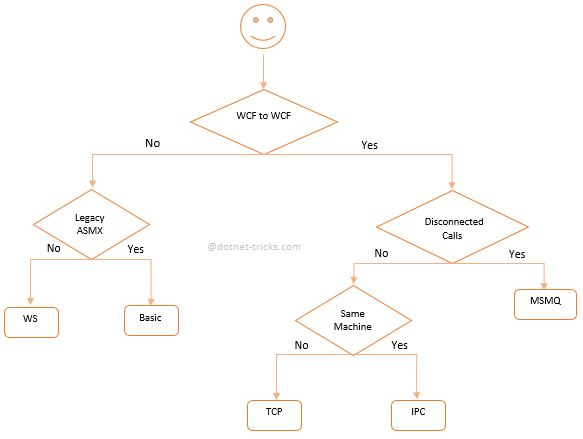 It is only used when communication is WCF – to – WCF means both client and service should have WCF. This binding is provided by the NetNamedPipeBinding class. It uses named pipe for Communication between two services on the same machine. This is the most secure and fastest binding among all the bindings. This binding is provided by the NetMsmqBinding class. It uses MSMQ for transport and offers sup-port to disconnected message queued. It provides solutions for disconnected scenarios in which service processes the message at a different time than the client send the messages. This binding is provided by the WSFederationHttpBinding class. It is a specialized form of WS binding and provides support to federated security. This binding is provided by the NetPeerTcpBinding class. It uses TCP protocol but uses peer net-working as transport. In this networking each machine (node) acts as a client and a server to the other nodes. This is used in the file sharing systems like torrent. 10. MSMQ Integration bindingThis binding is provided by the MsmqIntegrationBinding class. This binding offers support to communicate with existing systems that communicate via MSMQ.